on dot-gov: Is He A God? 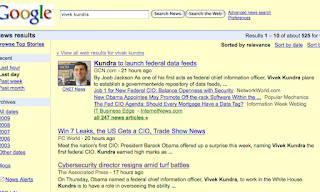 "We are Kundra" - I like that! This sort of gives more heft to Obama's much maligned comment in the media, "We are the ones we've been waiting for". Bottom line, the era of John Wayne coming to save the day while we all sit around and applaud are long gone (assuming they ever existed). Kundra's job is to figure out how to enable the harnessing of this mass enery for transformation into a directed force.